HMD Global, the licensee of the Nokia brand, unveils the latest iterations of its three remaining last year models in an event in Moscow today. Following its previous offerings, the main focus of the new devices is to provide a pure and secure Android experience while also bringing a refreshed hardware and aesthetic. 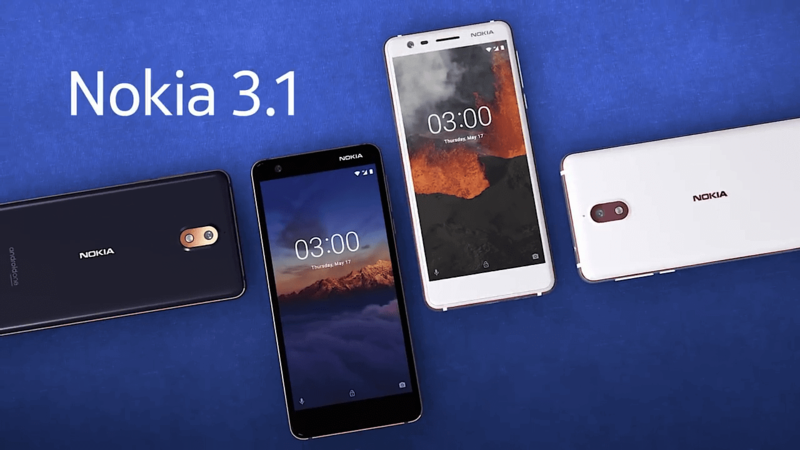 Of the latest releases, two of which belongs to the Android One program (Nokia 3.1, Nokia 5.1), while the budget Nokia 2.1 joins the Go Edition family. The all-new Nokia 2 features a slightly better display, improved processor, and better camera. 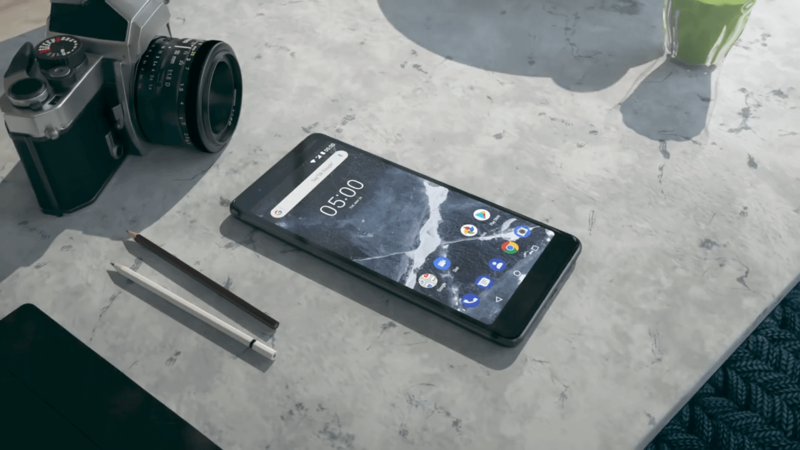 On paper, the Nokia 2.1 is not much of a different device from its predecessor. But the improved design, performance and slightly better camera are welcome improvements for the current users. The new Nokia 2 is rocking a 5.5” HD display as opposed to the rather small 5.0” display of the previous model. It is also running on Android 8.1 Oreo (Go Edition), optimized for its minuscule 1GB of RAM, and is free from any bloatware. A Qualcomm Snapdragon 425, albeit old, will also give the device a significant boost in performance if stack up side-by-side with the Nokia 2 (2017). The 8-megapixel primary camera can now record videos in [email protected], while the selfie-shooter remains at 5-megapixel. The battery is down to 4000mAh, a 100mAh less than the 2017 version, but HMD claims that the new Nokia 2 consumes 10% less power than its predecessor. Hence, the tagline “2-day battery life” remains. But the main highlight of the new model is the inclusion of dual-front firing stereo speakers, complementing HMD’s new Nordic design language. 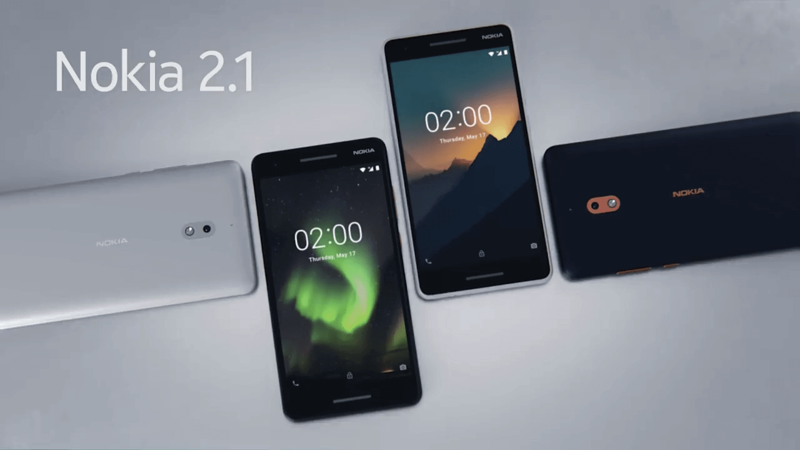 The Nokia 2.1 will be available in three color options: blue copper, blue silver, and gray silver and will retail at $115 starting July. The new Nokia 3 features a taller 18:9 aspect ratio display, improved processor, cameras. The new Nokia 3 sports a slim 5.2” HD IPS LCD display with 18:9 aspect ratio as opposed to last year’s 5-inch display in old 16:9 standard. Design-wise, the Nokia 3.1 features a scratch-resistant polycarbonate body accentuated by dual-anodized diamond-cut aluminum frame. According to HMD, the new device will be 50% more powerful than its predecessor. Thanks to octa-core Mediatek MT6750N. The new Nokia 3 will be available in two variants, one with 32GB/3GB RAM and 16GB/2GB RAM. HMD also improved the camera on the Nokia 3.1. The primary shooter now employs a 13-megapixel module with f/2.0 aperture. The newer and better CPU now allows the new Nokia 3 to record videos up to 1080p at 30 frames-per-second. The front remains at 8-megapixel, though fixed-focus, but is using a wide-angle lens for a group selfie. The new Nokia 3 will be available in three colors: blue copper, black chrome, and white iron. The device will retail at about EUR 139. Sale starts in June. Like the Nokia 3.1, the new Nokia 5 now offers a slimmer 18:9 aspect ratio display, better processor, camera and Android One ROM. HMD’s latest iteration of the Nokia 5 is no slouch. It features the unique Scandinavian design — much like its predecessor but shows more attention to details as far as aesthetic is concerned. The aluminum unibody is borrowed from last year’s version but is slimmer, taller, and more modern. Thanks to its large 5.5” FHD+ display with the trendy (but proved useful) 18:9 aspect ratio. The curved Gorilla Glass also accentuates the design. There’s no home button. The fingerprint scanner is now moved at the back, below the camera plate, for easy reach. Out of the box, the device will run on Android 8.0 Oreo with a promise of Android P update the moment it became available. MediaTek Helio P18 now powers the device, replacing the inferior Qualcomm Snapdragon 430. HMD claims that the new Nokia 5 is 40% more powerful than its predecessor. The Nokia 5.1 will be available in two configurations, one with 32GB/3GB RAM and 16GB/2GB RAM. The primary camera is now a 16-megapixel shooter with Phase Detection Autofocus (PDAF) but with the same f/2.0 aperture lens. Unfortunately, the video recording is maxed out at [email protected] No 4K. Note that the Nokia 6 (2017) has the same camera specification, so probably it is the same camera module. The 8-megapixel front-shooter is now using a fixed-focus, wide-angle lens for a wider group selfies. 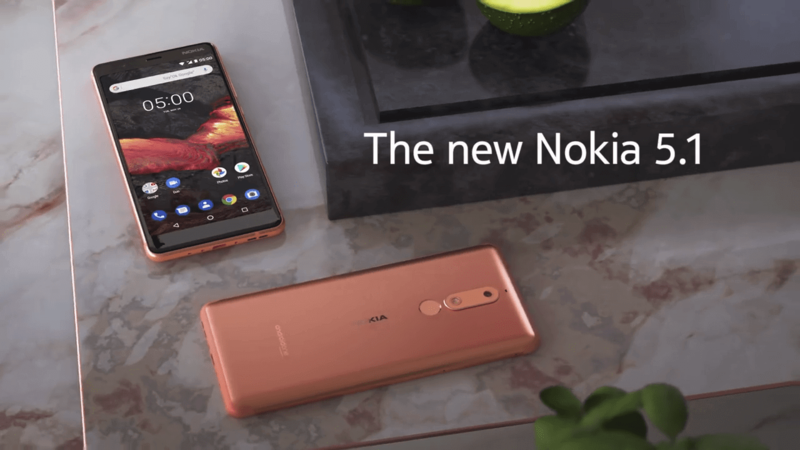 The Nokia 5.1 will be available in satin copper, polished blue, and black color options. Sale starts in July for EUR 189.